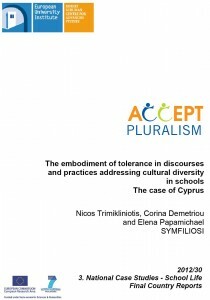 The report examines the processes, methods and practices of the Cypriot educational system as the embodiment of tolerance in discourses and practices addressing cultural diversity in schools. These are mediated by the perceptions of policy makers, the convictions of stakeholders involved in the processes and abilities of and tools made available to educationalists. In examining the nature of theeducational system and particularly the way in which the system treats its minoritised individuals andgroups, the philosophy which emerges is that of viewing diversity as a disadvantage and a deficiency that needs to be ‘treated’, against a backdrop of essentialising and reifying culture and ethnicity. The learning of the Greek language is prioritized, with assimilatory implications. The current model of intercultural education is based on contributions and additions by ‘other cultures’, whilst racism is construed as a pathologised individualistic attribute that may be challenged and combated through ‘learning’ about other cultures. At the same time, institutional and structural racism and inequalities are unacknowledged and ignored. Research shows that despite the rare instances of resistance and exhibitions of agency by some teachers and children to the dominant racist discourses and practices, institutional everyday racism operates in various ways and at various levels, negatively affecting the experiences of both the minoritised and majoritised groups and individuals involved.